A finger jointing cutter with a design that offers an economical solution to extending the length of boards. The cutter is fitted with a guide bearing, which may be used in conjunction with a straight edge fixed under the workpiece. This allows the joint to be made with the router being hand held. The cutter may also be used with the machine mounted in a table. In use, one piece of stock is cut face up whilst the other is cut face down. 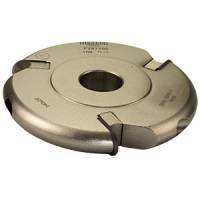 A maximum thickness of 32mm may be joined with this cutter. This cutter is not really suitable for joining boards on their width as the narrow fingers make it difficult to produce a joint without feather edges.